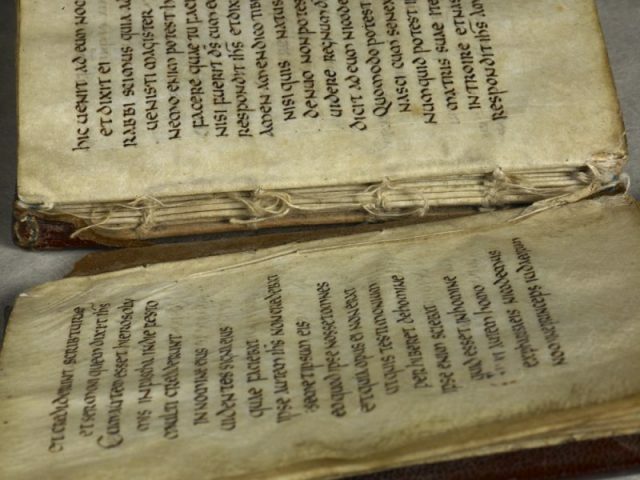 Europe’s oldest book is soon to go on display in a new exhibition at London’s British Library. Anglo-Saxon Kingdoms: Art, Word, War will feature a number of incredible artifacts and manuscripts, including the Domesday Book and the beautifully illustrated Lindisfarne Gospels. However, one of the star attractions is set to be a 1,300 year-old, small red book. 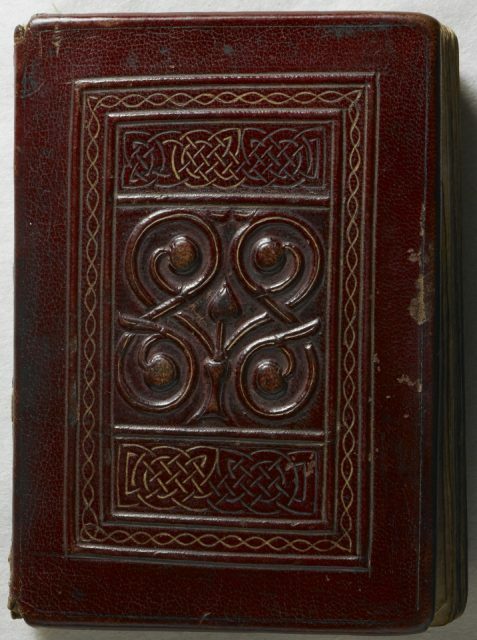 The front cover; the original tooled red goatskin binding is the earliest surviving Western binding. 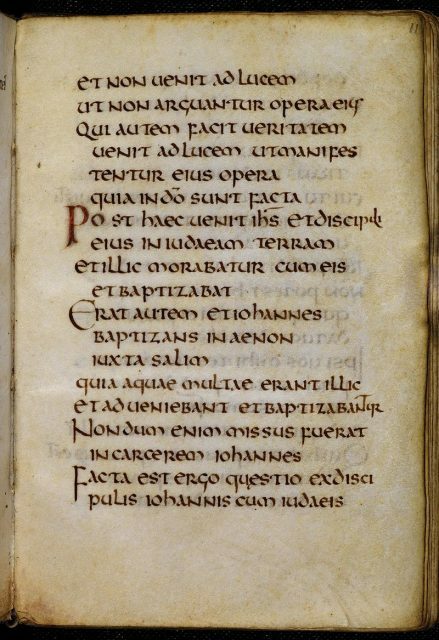 The St. Cuthbert Gospel is a landmark in the history of European publishing. 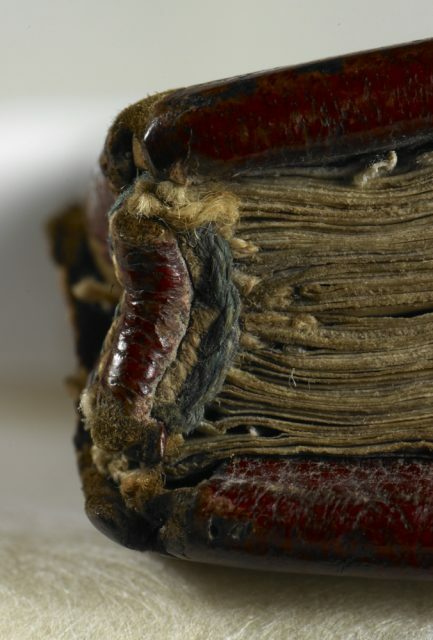 It is the oldest surviving European book that is still held together in its original leather binding. Despite its small size, this incredible manuscript can tell us a great deal about books in the early Middle Ages, including how they were made, and more importantly, how they were used. 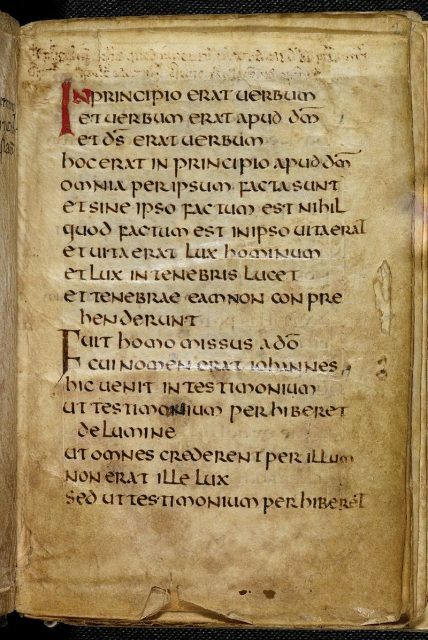 The St. Cuthbert Gospel has long been shrouded in mystery, but historians working at the British Library have recently dated it to the late 7th century. It was first discovered in 1104, when the relics of one of Britain’s most important saints, Cuthbert, were moved to a new shrine in Durham. The binding disassembled during examination. 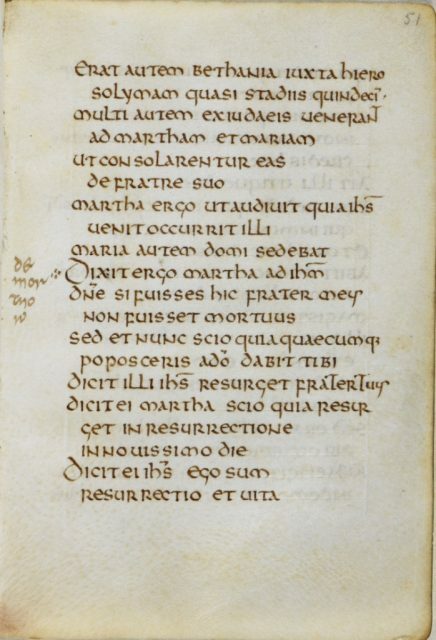 Folio 51r, showing Jn 11 -18-25a, with one of the requiem readings marked at line 10. According to the BBC, St. Cuthbert was associated with many miracles, not least of which was the fact that his body never seemed to decay. Upon opening his coffin a decade after his death, monks were amazed to discover that his flesh was still intact and uncorrupted. Word spread, and soon the shrine of St. Cuthbert was one of the biggest tourist attractions in medieval Britain. Folio 11 of the book. When the monks moved St. Cuthbert’s relics to Durham in 1104, they decided to take a peek inside the coffin in order to make sure that the saint was still intact. Miraculously, his body was still as fresh as the day he died, and the monks ceremoniously redressed him and placed him back in the coffin. However, before they sealed it up, they noticed a small book. It was a copy of the Gospel of Saint John, bound in red leather, and perfectly preserved along with the body of the saint. Marveling at its age and perfect condition, they decided to take it out of the coffin and keep it as a separate holy relic. 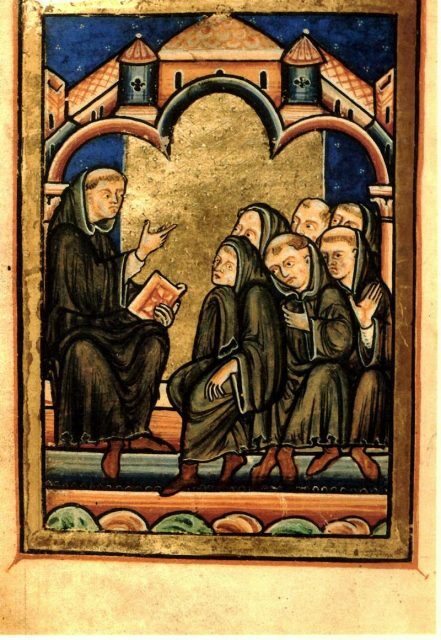 Cuthbert teaching with a book in his hand (Ch 16, Life of Cuthbert). 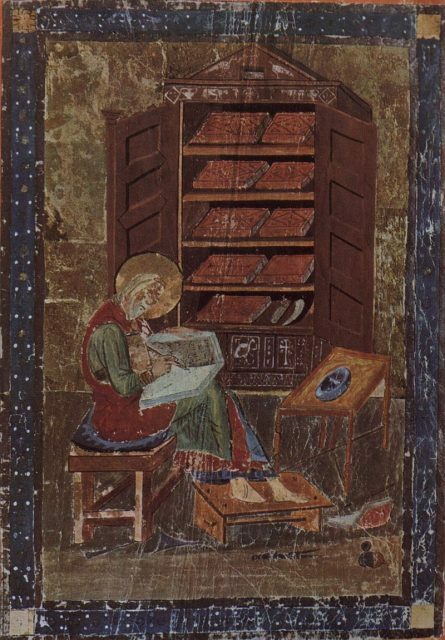 According to Allison Meier in an article for JSTOR Daily, books, especially those containing all or parts of the Bible, were not just for reading in the early Middle Ages. 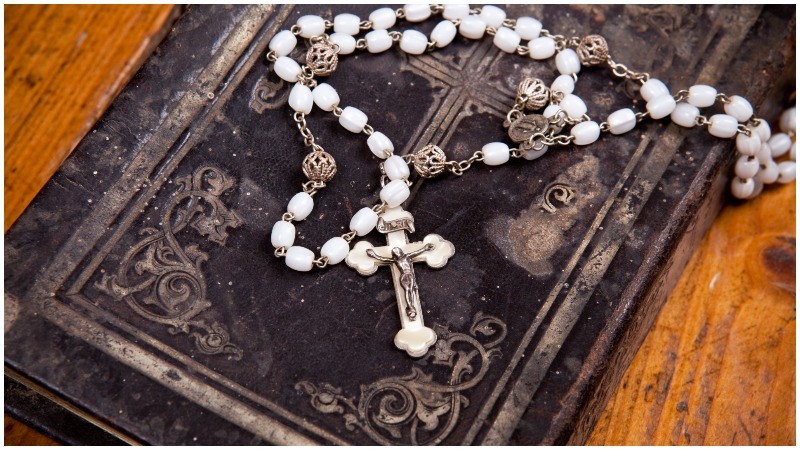 They were often preserved as sacred relics and worn as talismans to keep away evil. Merely the presence of a holy text was thought to confer special protection. This book was assumed by the curious monks to have been a possession of the great St. Cuthbert himself, which meant it was believed to be even more potent. 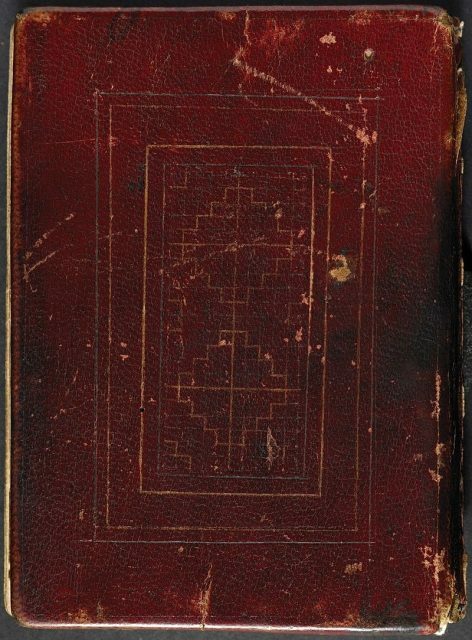 Books bound in red, presumably leather, from the Codex Amiatinus, made slightly earlier at Monkwearmouth–Jarrow Abbey. It was originally thought that the book was placed inside the coffin of St. Cuthbert in 698, although historians now believe it was actually written in the early 8th century and made its way into Cuthbert’s coffin soon afterwards. It is not clear who commissioned it, and we know little of the scribe who painstakingly copied each line of the Gospel of St. John onto the parchment. This anonymous scribe, however, was particularly talented. Historians regard the text as a fine example of elegant early medieval handwriting, and the leather cover is particularly beautifully designed. The style of the book’s construction tells us a lot about the transmission of knowledge and skills across Europe during this period, as Allison Meier notes. The book is bound in a particular ‘unsupported’ style, known as link stitch binding. This is also called Coptic sewing as it originated among Coptic communities in Egypt, but it was used across Europe, Byzantium, and in the Islamic world. This ancient manuscript is therefore evidence for connections between northern Britain, the rest of Europe and the Mediterranean, even in the 7th century. This ancient book offers a rare glimpse into the past, showing the ways in which medieval Britain was connected to other parts of the world. And if you can’t make it to the British Library to see the manuscript in person, then don’t despair. The St. Cuthbert Gospel has now been fully digitized, meaning that it will continue to inspire and fascinate people across the world for generations to come.